Last Spring while skiing in southern British Columbia, one of our group triggered a sizeable avalanche. No question that the snow was tricky and less stable than we might have liked, yet we were skiing low angle slopes, and felt relatively safe. This snow field hadn’t slid for the past 29 years according to our friend Rod. None of us were caught in the slide though this writer found himself climbing a small tree, skis still on, just a few feet away from the snow as it flowed past him. To say we were shaken by the experience would be an understatement. We elected to not ski the next day and instead went to Halcyon Hot Springs and spent a better part of the day soaking in their waters, which are famous for their high lithium content. The very word halcyon means calm and serene, and that’s how we felt after a few hours relaxing in these waters. The water in this sping is claimed to have the highest lithium content ever found, six times that of any other spring. Halcyon’s “bottle works” were erected in 1898. 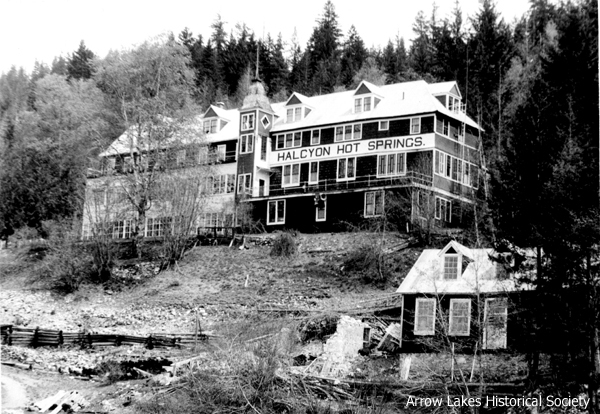 The Halcyon Hotel operated from the 1890s until it was destroyed by fire in the 1950s and was a popular heath retreat and party place. Soaking in any warm water is relaxing. Soaking at Halcyon seems to be more so. After three hours in the pool, we ate lunch, and being a bit dehydrated guzzled spring water to our heart’s content. Content being the operating word here. I was reminded of this relaxing day by an article that was published in September 13, 2014’s New York Times on the effects of low dose lithium. Anna Fels in her op-ed piece reviews some of the past research on low dose lithium and suggests that perhaps many people might benefit from its use. Rather than attempt to summarize it, let me simply paste the text somewhere further below. As Ana Fels points out in the NY Times, it has been known for years that areas of our country with higher lithium in the water have significantly lower incidence of, shall we call it, dys-social behavior? A Septermber 2014 paper reports on the analysis of the combined published data on lithium and Alzheimer’s disease and other behavioral changes. It looked at studies that examined effects in patients taking prescription lithium for bipolar disease and also populations exposed to higher than average levels of lithium in their water. Worthy of mention is a clinical trial, published in January 2013, in which patients with Alzheimer’s disease were treated with very low dose lithium. When treating bipolar disease, lithium is used in high doses, 150-600 mg per day. In this study patients with mild Alzheimer’s disease were treated with 300 micrograms once a day for 15 months. While the main use of lithium has been to treat bipolar disease, some doctors also use it to treat hyperthyroidism. High dose lithium can shut down thyroid hormone production. In lower doses of 5-10 mg/day it has also been suggested for a range of psychological ailments. A May 2014 clinical trial suggests lithium in combination with valproic acid may have benefit in ALS. Perhaps when I return to British Columbia next year I will have the good sense to spend less time skiing and more time soaking up the lithium. Aust N Z J Psychiatry. 2014 Sep;48(9):809-818. Epub 2014 Jun 11. Mauer S, Vergne D, Ghaemi SN. Nunes MA, Viel TA, Buck HS. Microdose lithium treatment stabilized cognitive impairment in patients with Alzheimer's disease. Curr Alzheimer Res. 2013 Jan;10(1):104-7. BMC Med. 2012 Nov 2;10:131. doi: 10.1186/1741-7015-10-131. Using lithium as a neuroprotective agent in patients with cancer. Khasraw M, Ashley D, Wheeler G, Berk M.
Stem Cells Transl Med. 2012 Jun;1(6):469-79. doi: 10.5966/sctm.2011-0046. Epub 2012 May 30. Enhanced lithium-induced brain recovery following cranial irradiation is not impeded by inflammation. Malaterre J1, McPherson CS, Denoyer D, Lai E, Hagekyriakou J, Lightowler S, Shudo K, Ernst M, Ashley DM, Short JL, Wheeler G, Ramsay RG. Neuro Oncol. 2008 Oct;10(5):690-9. doi: 10.1215/15228517-2008-041. Epub 2008 Aug 20. Lithium inhibits invasion of glioma cells; possible involvement of glycogen synthase kinase-3. Nowicki MO1, Dmitrieva N, Stein AM, Cutter JL, Godlewski J, Saeki Y, Nita M, Berens ME, Sander LM,Newton HB, Chiocca EA, Lawler S.
J Neurol Sci. 2014 May 15;340(1-2):103-8. doi: 10.1016/j.jns.2014.03.005. Epub 2014 Mar 11. Clinical and biological changes under treatment with lithium carbonate and valproic acid in sporadic amyotrophic lateral sclerosis. Boll MC1, Bayliss L2, Vargas-Cañas S3, Burgos J4, Montes S5, Peñaloza-Solano G6, Rios C7, Alcaraz-Zubeldia M8.